Whether standing alone in majestic solitude or clustered in a stately phalanx, pine trees can’t fail to make a statement. And given their adaptability to a variety of soil types and climates (not to mention the stunning varieties on offer) pine trees are an ideal option when it comes to selecting trees for a living fence. Take the Virginia pine, for example. One of the best known of the southern yellow pines, the Virginia pine (Pinus virginiana) thrives in average soil and does well even where soils are deficient. Its pleasing form (the Virginia pine is a favorite for Christmas trees) and its moderate height make it useful as a practical, attractive living fence option. Another excellent choice for a living fence is the Loblolly Pine Trees (Pinus taeda), another of the southern yellow pine varieties. The Loblolly likes its soil moist, so well deserves consideration for a lowland area. As one of the fastest growing of the pines, the Loblolly pine tree will function well in a fence designed to prevent soil erosion. Unlike the southern yellow pines, white pine trees (Pinus strobus) are native to colder climates, forming some of NE America’s most iconic old-growth forest reserves. White pine trees thrive in colder climates where the soil is well-drained and fertile, but will readily tolerate damper ground. If you select white pine for your living fence, you can look forward to enjoying them for a very long time: some individual trees in the US Midwest are five hundred years old! The Jeffrey pine, otherwise known as the yellow pine tree (Pinus jeffreyi), is native to the western USA. This drought-tolerant tree can adapt itself to a variety of soil conditions, making this yellow pine tree variety a perfect candidate for a living fence meant for dry ground at any altitude. Uniquely suited to moist soils and tolerant of shade, the Spruce pine (Pinus glabra), with its glossy dark-green needles and slender cones, grows to a medium height and is native to mixed woodlands. This makes the Spruce pine an ideal choice for the living fence containing a variety of evergreen species. Pine trees are lovely year-round trees that offer color and beauty to any yard or landscape. They are widely known for providing wind protection especially in the winter months and are often quite hardy trees. Also, Pine trees make excellent border trees, and of course, are cultivated for their use as Christmas Trees all over the world. There are a few Pine trees that are well known to be the most popular of the pine tree group. The White Pine is a soft-bristled Tree that offers excellent summer shade and beautiful coloring. They are a sturdy tree, and it is a tree whose branches are quite famous for making Christmas wreaths. 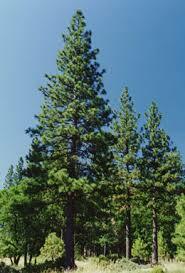 The White Pine can grow at a relatively rapid rate of 2 to 3 feet a year and can reach quite staggering heights of 80 feet tall with an average top width of 25 to 30 feet. It can handle dryer climate conditions if it is not planted too close to other trees. The Loblolly Pine is one of the fastest growing pine trees and is quite popular in the southern United States. Part of this is because it can tolerate more dryer soil compositions as well as warmer climates. The Loblolly Pine can grow to incredible heights of up to 100 feet, and a top width of up to 35 feet. The Virginia Pine is a small to mid-sized pine growing to approximately 60 feet in height. It has a more shallow root system so it should be planted was other more massive trees wouldn't kill it off. 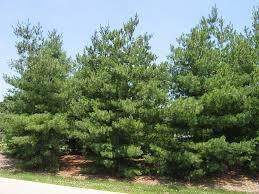 The Virginia Pine is also pretty hardy and should be planted in full sun. They can respond well to trimming and can handle drier climate conditions. The Spruce Pine is one of the tallest of the pine trees and can reach up to 150 feet in height. It is a weather-hardy tree and typically does not grow into maturity until it is 60 to 70 years old. The Spruce Pine prefers soil that has a higher water table. It also does not grow well in full sun and should be placed in partial shade to help foster better growth. 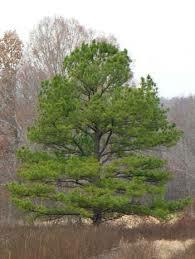 The Yellow Pine is also a favorite Christmas Tree Pine and has a vast area of habitat. It can grow to heights of 100 feet and has a wide range of climate locations from Florida to Kansas. Because it can handle warmer climates, it makes for a good tree even near the southern ocean areas. It is also quite resilient during forest fires. The Yellow Pine can handle both rocky and wet soil conditions. The Longleaf Pine is a medium-sized pine tree that can grow from 65 to upwards of 150 feet in height. It can thrive in moist soil and can handle drier soil types as well and does well in the sun. The pine needles can grow up to an incredible 18 inches in length. The LongLeaf Pine tree is a native pine tree to the Southeastern portion of the country. The Austrailian Pine typically grows to a modest 70 feet in height and has a top width of 30 feet. This tree is diverse and can grow in both partial shade and full sun. Also, this pine tree is quite hardy with many different soil types. The Austrailian Pine is suitable for more arid locations and thus can be tolerant to drought conditions, as well as tolerating wet soil conditions. It is widely known for growth in warmer regions of the country and originated in Australia.